A hitman murders the beloved brother of a brilliant rogue surgeon. The surgeon hires one of the hitman’s clients to kidnap the killer and bring him to her. She performs gender reassignment surgery on him. That’s both her revenge and her experiment. Will the assassin accept this second chance at life or will he continue his violent ways? Hamill wrote the original screenplay in 1978. It was called Tom Boy and its protagonist was a juvenile delinquent who raped and killed the wife of a plastic surgeon. Hill optioned the screenplay twice, rewriting it. 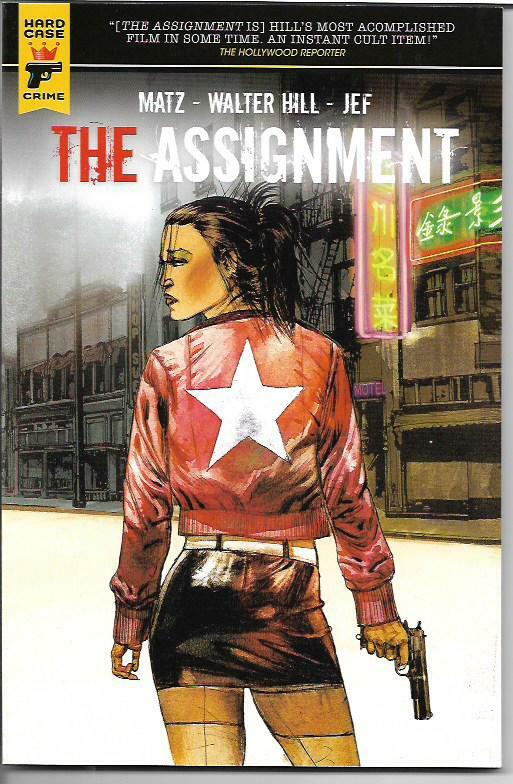 He had success with a earlier graphic novel in France and so decided to do The Assignment as a graphic novel. The graphic novel attracted an investor, who asked that the movie be done very cheaply and that it have recognizable names in the cast. To Hill’s credit, the movie doesn’t look cheap and he did sign some terrific actors for key roles. I watched the movie after reading the comic book. The movie lacked the depth of characterization of the comic book. The actors always seemed to be consciously acting and, given the pedigree of the cast – Michelle Rodriguez, Sigourney Weaver, Tony Shalhoub – that was immensely disappointing to me. Rodriguez plays hitman Frank Kitchen both before and after surgery and never looks the part of the male hitman. The frequent violent action scenes were very well staged. There were some good moments between Frank and a woman who becomes important to him, and between Frank and a dog he rescues from a man who trains dogs to fight. The ending of the movie indicates a new direction for Frank, but doesn’t demonstrate it in the slightest. Like I said, the comic book is way better than the movie. The Wikipedia page for the movie doesn’t mention Matz or Jef. The former is a well-known French writer who has had previous graphic novel success with some of his works being adapted or optioned for movies. I couldn’t find any information on Jef, but, after looking at his riveting drawings and storytelling, I agree with the graphic novel’s description of him as an “artist extraordinaire”. Matz and Jef bring Frank Kitchen to life in much more vivid fashion than did the movie. I felt they got me more into his head than the movie. Best of all, they continued the story, albeit only for a few pages, beyond the movie. Their satisfying final scenes made me want to see more of this character and his life going forward. Sidebar. In this column, I used male pronouns for Frank because he isn’t transsexual. His gender reassignment was not something that he wanted. It was done to him against his will. He remains Frank, even as he makes adjustments to his life. I intend no disrespect to the trans community. I tried to avoid spoilers as much as possible because I think the adaptation is well worth reading. If Hill, Matz and Jef – or other comics creators – have more to say about Frank, I would definitely be on board with those stories. Walt Disney’s Donald Duck: The Complete Sunday Comics 1939-1942 by Bob Karp and Al Taliaferro [IDW; $49.99] is my pick of the week. These original newspaper strips were reproduced from the pristine original material in the Disney Vaults, the real-world equivalent of Scrooge McDuck’s Money bin. Donald made his Sunday newspaper debut in several episodes of the popular Silly Symphonies page. His own comics page launched shortly after that and became an instant hit. Reading these strips, each a short comedic story that stands on its own, made it clear why that was the case. They are masterful little cartoons on paper featuring Donald battling against a world that defies him and often gets downright insulting about it. One has to admire the confidence of our man Don, as well as his endless optimism and pure stubbornness. Even though these strips are almost eighty years old and are clearly products of their times, they are still entertaining today. Writer Bob Karp was a master gag writer. He started working for the Disney company in the 1930s and continued writing the Donald Duck newspaper strips into the 1970s. Artist Al Taliaferro was a great counterpart to Karp with the ability to add a surprising fluidity to his two-dimensional drawings. It’s easy to imagine these amazing strips as animated cartoons. 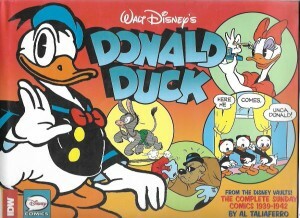 Donald Duck: The Complete Sunday Comics 1939-1942 was an absolute joy to read. I recommend it for readers of all ages. Continuing my quest to get relatively current with DC’s super-hero comics, I read Red Hood and the Outlaws though issue #8 [$2.99 per issue]. Sadly, the title isn’t doing it for me, even though I think the team roster is nothing short of brilliant. You have Red Hood (Jason Todd) who was Robin and therefore in line to be Batman before he got murdered and revived and turned into a mostly-but-not-always grim-and-gritty vigilante at odds with much of the super-hero community. You have Bizarro, who, as we know from countless stories, is an imperfect duplicate of Superman, but kind of likeable in his own way. You have Artemis, who is not completely unlike Wonder Woman. 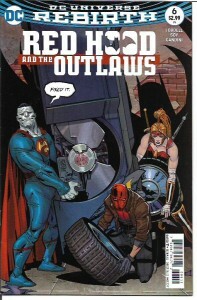 Red Hood and the Outlaws stars DC’s big three except they are not the big three, just a twisted reflection of the big three. Which is a terrific notion. Out of the hope that this comic-book series will rise to the level of the terrific notion at its core, I’ll continue to read it. I aspire to optimism.